A civil engineering degree from Oregon Tech prepares students for professional practice by using industry standard tools and innovation. Oregon Tech’s Civil Engineering degree will provide you with real world, hands-on education to practice structural, transportation, water resources/environmental, and geotechnical engineering, incorporating professional communication skills and team work. Whatever your individual interests, you'll learn both the theory and practical application of design and not just in your last few senior classes. Design work starts in the first year and builds in complexity throughout the program as you prepare for immediate employment and eventual licensure as a Professional Engineer. In your fourth year of study, you have the option to target specific careers within the broad field of civil engineering. The first freshman-to-master's Civil Engineering degree program, in the Pacific Northwest, allowing students to move seamlessly into graduate study while completing their bachelor’s degree. Engineering students built a solar powered tiny-house from scratch in just 20 weeks. 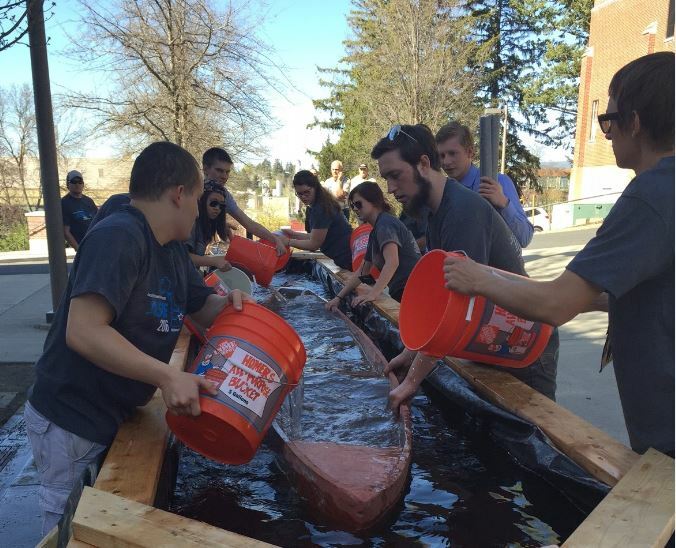 Students compete in the Steel Bridge and Concrete Canoe competitions every year in different states (hosted at Oregon Tech in 2018). You can find more information at the ASCE website. The Oregon Tech student chapter sponsors several students to attend conferences or events every school year such as: Meet a CE Day, Workshop for Student Chapter Leaders, ASCE Regional Student Conference, Etiquette Dinner, etc. The Oregon Tech student chapter sponsors several students to attend conferences or events every school year such as: The Traffic Bowl, the Annual Meeting of the Transportation Research Board in Washington D.C., Asphalt Sustainability Conference West, etc. The freshman-to-master's MSCE degree at Oregon Tech, in addition to our traditional post- baccalaureate master’s degree, is a practice-focused graduate degree, which equips students to meet industry needs identified by the American Society of Civil Engineers (ASCE). The degree has both project and thesis options and offers courses in water resources, structural, transportation, environmental, and geotechnical areas. This unique pairing of degrees prepares future professionals for industry specific careers. For more information please contact the graduate program director. Oregon Tech's BSCE program is accredited by the Engineering Accreditation Commission of ABET Inc. ABET accreditation is your assurance that our program meets the quality standards established by the engineering profession. Oregon Tech works closely with alumni, employers and the American Society of Civil Engineers (ASCE) to ensure that students graduate with the skills necessary to be successful. Graduates have career opportunities with consulting firms, government agencies, heavy construction and municipalities. Civil engineering graduates may consider a concurrent degree in environmental sciences to expand career opportunities. why soils and foundations are so imperative tobuildings, bridges, and roads.